2. Remember the red door I loved a few weeks back? Well, this yellow one I saw in Richmond on Sunday is now fighting for my affections, too! 3. How opulent are these gold brushed bowls from Harabu House? 4. Enjoyed talking a walk along the Thames in Richmond on Sunday afternoon. The sun's rays looked pretty as they peeked through the clouds. 5. My favourite pair of red, white and navy socks always make me smile. 6. 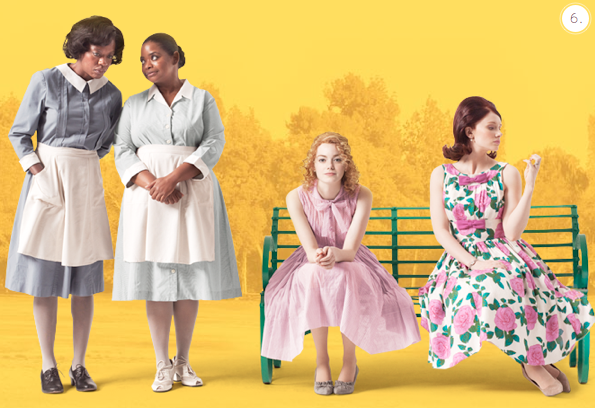 Went to see The Help for a second time; such a thought-provoking, amusing and moving movie. 7. 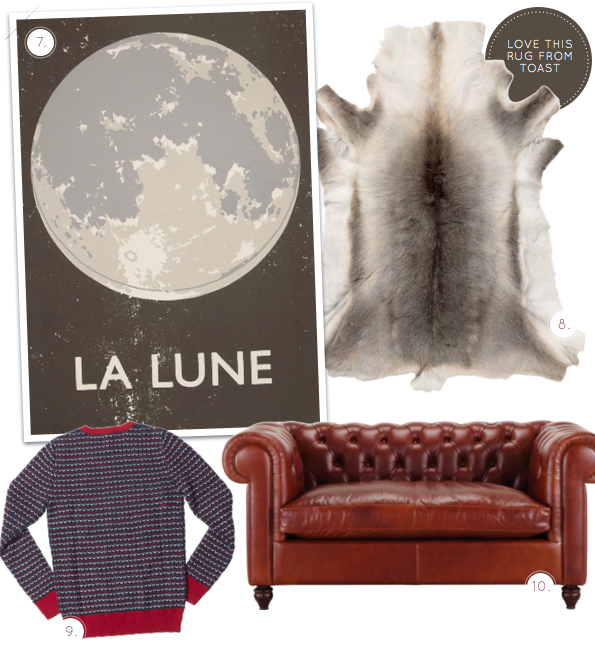 Seriously tempted by this striking La Lune print. 8. I think I've found the right rug to go in the bedroom. 9. This jumper from Reiss looks colourful and cosy - perfect for Mr. Bazaar! 10. There's something charming about this two-seater Chesterfield. Those chocolate delights are such an indulgence but oh so mouth watering! As for favourite socks.....I'm sure everyone loves to slip into their very own super comfy pair.Love the stripes! If I had more money, Toast would be my favourite shop. I order their catalogs just to look at the beautiful photos. I have been looking at a reindeer rug to, but from a Swedish department store. They are so cosy! Love the two-seater Chesterfield as well! I loved The Help book, I really must get round to seeing the film! Love the grown up treat! Yum. And the gold brushed bowls.... just lovely! I agree with you (as usual!) 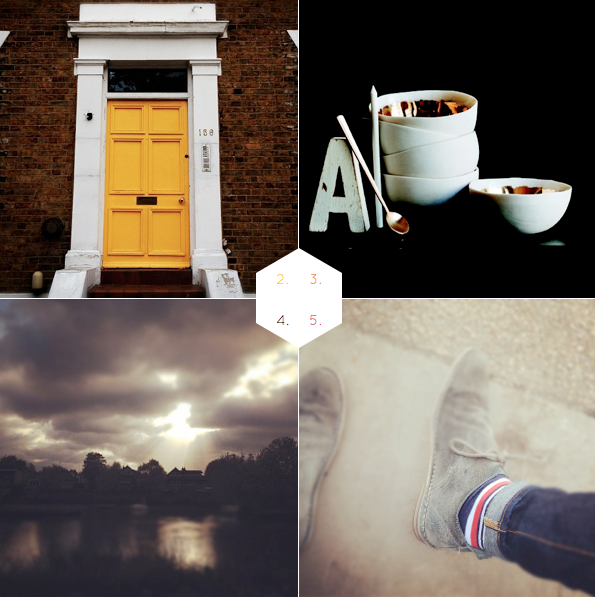 and share a deep love for Jamie's treats (both chocolate and less sugary ones..) yellow doors (insta' smile! ), and walks in Richmond. I am also drooling over reindeer skins right now and have found one that will look heave on my sofa for Winter (so Scandi right!?!). A Chesterfield is also on my wishlist - I am dreaming of a vintage, worn one in cognac leather. YUM! Not so happy hugs (my husband had to go back to Australia on Saturday) from Sweden. I really need to get along and see the help! Everyone seems to love it. Those chocolates and that yellow door are looking particularly good Will! @Maryann - Thanks, they are my favourite pair! @Annette - Thanks, hun. Hope the dinner party went well this weekend! @Jamie - Oh, I know. Toast are fantastic, right! @Hannah - I plan on reading the book now I've seen the film! @Maria - Yes, those Harabu House bowls are BRILLIANT! @Karine - I've had my eye on the reindeer rug from Toast for some time. Perfect for the bedroom! @Abbey - I was in love with the yellow door the moment I saw it! Have a fab week! oh! i just loved the movie 'the help' read the book and just saw the movie recently too! the book really adds to the movie. did you read it? love everything else as usual. i need to spend a weekend in your shadows so i can love and learn all these amazing things too! Loving the yellow!!! Perfect day for it too as I have on my yellow stockings. Everything just looks so lovely! I've always fancies a yellow front door, this one is particularly grand! @Micheal - I've not read it yet but plan to now that I've seen the film. Thanks for stopping by! @Cait - Yellow is such a happy colour! @Amanda - You should order it anyway! Boys jumpers can look fab on girls as well, I think! @Caroline - Imagine walking up to that yellow door everyday? It would make the most overcast of days sunny! I'm going to watch the help on Wednesday, cant wait, especially if you watched it twice! I saw your Laura Ashley post, cute!! Helena - I think you will like it - let me know what you think! love this idea! All your finds are amazing -- specifically the rug! @Julia - I am soooo tempted by the rug... would be perfect in the bedroom! Also loving the yellow door. The chocolates look divine. Is there a recipe from Jamie? @annporter -Yes, the yellow door is very lovely! 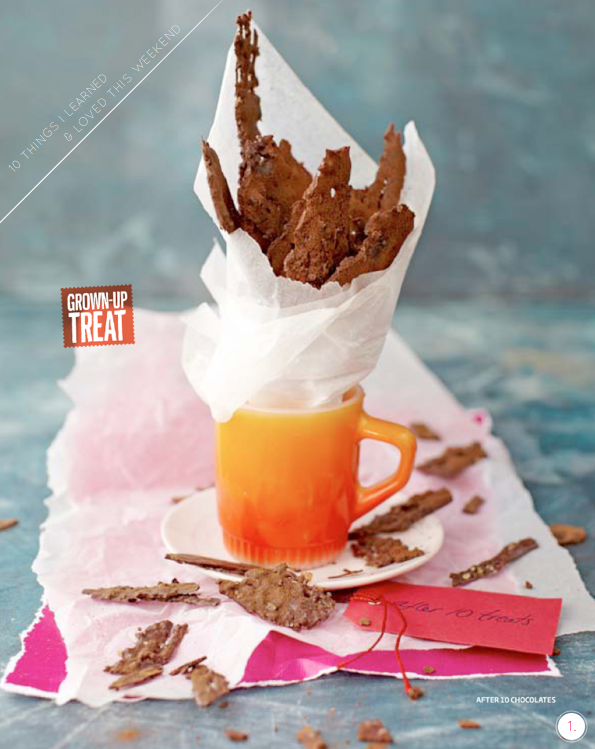 Re: recipe: yep, it's inside the December issue of Jamie magazine. a friend of mine just lent me "the help" for my upcoming trip. can't wait to dig into it! @Peggy - You'll have to let me know what the book is like; heard it's excellent. @Lisa - Glad you enjoyed the film as well! I've had my eye on the moon print for awhile. Growing up, we had a stunning photograph of the earth captured from outer space hanging in our hallway: this reminds me of that in all of its majestic awesomeness. Our universe is pretty amazing, huh? @Kayla - Definately, I think it's fascinating. You should get the print as a memory of your childhood home! How do I get in on that grown-up treat?! That looks amazing!